The widespread use of automobiles relies upon vast networks of infrastructure and laws that have been set in place over the years since the first vehicles hit the roads. Paved streets, service stations, and parking lots are just a few of the things that the automobile relies upon for its daily, year-round use. While automotive advertisements focus on the freedom of owning an automobile, urban traffic jams, snow storms, and speed limits are a daily reality for Canadians. A Suburban District speed limit sign in North York, Ontario., c.1963. City of Toronto Archives, fonds 217, series 249, item 182. The growing population and workforce of the 1950s saw the rise of “suburban sprawl” – with new houses, schools, parks, and shopping malls and an increased reliance on the car. Plus other changes: in 1977 all posted speed limits across Canada were officially altered from miles per hour to kilometres per hour. 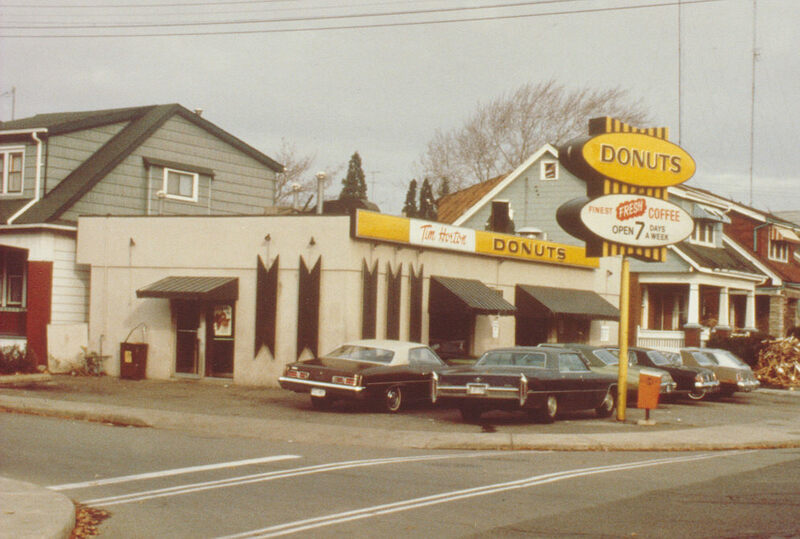 Coffee and donuts are constant features of Canada’s car culture thanks to the Tim Hortons chain, founded in 1964 in Hamilton, Ont.The first Tim Hortons restaurant, Hamilton, Ontario. Image courtesy of Tim Hortons. The city of Sudbury, Ontario, claims the honour of having installed the country’s first parking metres in August of 1940. Town bus on Queen Street West at Main Street, Brampton, Ont., c.1960. Region of Peel Archives/Cecil Chinn Fonds. Blackburn’s Service Station in Vancouver, B.C., 1928. City of Vancouver Archives, AM54-S4-: Bu.N274.2. Beverly Hills Motor Hotel in North York, Ont., c.1967. City of Toronto Archives fonds 217, series 249, file 8. For nearly half the year, driving in Canada faces the threat of snow and ice. Cleaning snow off a car in Ottawa, Ontario., 1959. Library and Archives Canada/Rosemary Gilliat Eaton fonds/e010977876. — Bob Jorgenson, on driving a Studebaker on the farm in Manitoba during the 1930s.